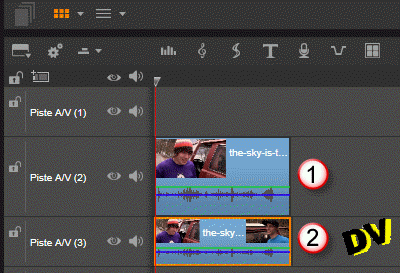 Both versions use the NewBlue Video Essentials plugin. But users who don't have these plugins won't be forgotten. I suggest you create two effect compositions from a combination of three existing plugins in the Studio Ultimate Versions starting with v18. Depending on the composition effect used, you will get one of the results shown below. Insert the first sequence to blur on A/V Track(2) for example. Duplicate this sequence on the track below, A/V Track(3). 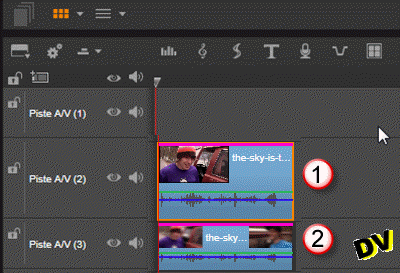 Double-click on the sequence on A/V Track(2) to access the Effects Editor. 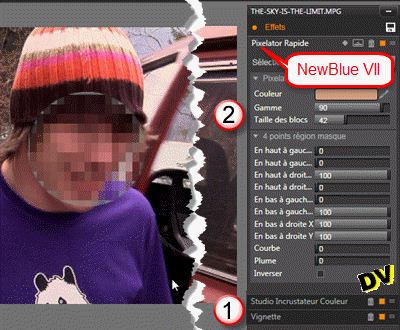 In the Effects Editor, apply the 7-Add-ons / NewBlue Video Essentials II / Vignette effect. Set the form (size and position) based on the face to be blurred. Set the frame with the Color values to plain green (R = 0, G = 255, B = 0). Set all border settings to zero. Without leaving the Effects Editor, apply a second effect. 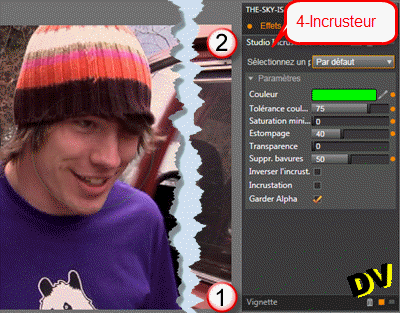 Apply the 4-Keyers / StudioChromaKeyer Effect. The color green has become transparent. In the preview, you see the superposition of two images: the disk of the sequence placed on A/V Track(2) and all that is around the disk placed on A/V Track(3). Again, without leaving the Effects Editor, apply a second effect. Apply the 2-Camera / Blur effect. Note the two effects previously applied are still there. Adjust the blur amount using the Horizontal and Vertical parameters. Click on the "Floppy Disk" icon in the upper right of the window. Enter a name for your effect composition (MySpot1 as an example). 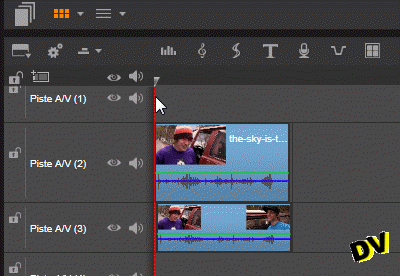 To avoid doing everything all over again, always stay in the Effects Editor. You have saved your first effect composition, we will start from the first effect composition and edit that to get our second effect composition. For starters, remove the last effect you applied, 2-Camera / Blur by selecting it and clicking on its "Trashcan" icon . Notice the two effects previously applied. Keep the color that approximates the color of the skin by modifying it slightly if necessary to achieve a more efficient pixelation. Set the range and the block size. 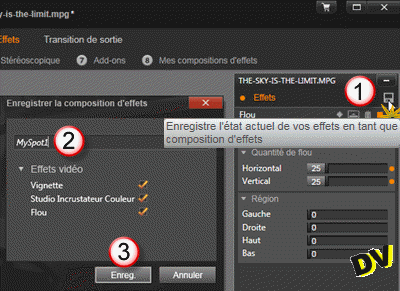 Save your second effect composition as MySpot2 for example. Take any video sequence to blur that you duplicated on the track below. Apply an effect composition on the upper track sequence. Put the cursor at the start of the sequence. Open the settings for the Vignette effect. Activate keyframing by clicking the diamond-shaped icon. Create as many keyframes as necessary. The more keyframes used means smoother face tracking. 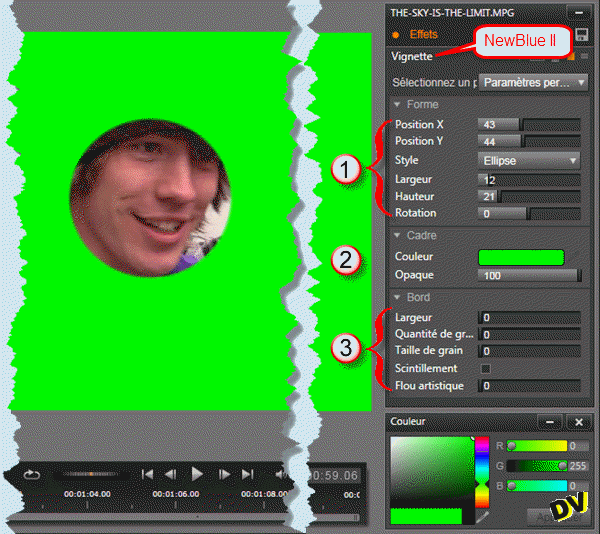 At each keyframe, set the X and Y positions for the blur spot so it covers the face. If needed, reset the width and height of the spot to modify the dimensions of the spot. Special feature: In the interim space framed in red, you do not need to blur. The width and height of the spot are set to zero: it is invisible. 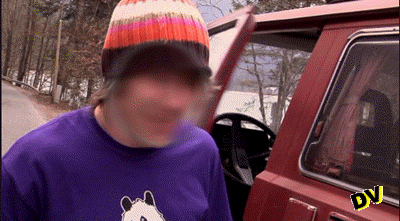 The old solution described in the tutorial Blurring the face of a moving person which consisted of using the blur in conjunction with the PLS-Spotlight transition included in HFX 15-Video and Film is still usable on the condition of changing the transition for the PLS-Spotlight transition included in Volume 1 HFX-15 Video and Film because it no longer works with the HFX Filter 64 bit. Let's implement this workaround for the Studio 16 and later versions. Duplicate this sequence below it on A/V Track(3). 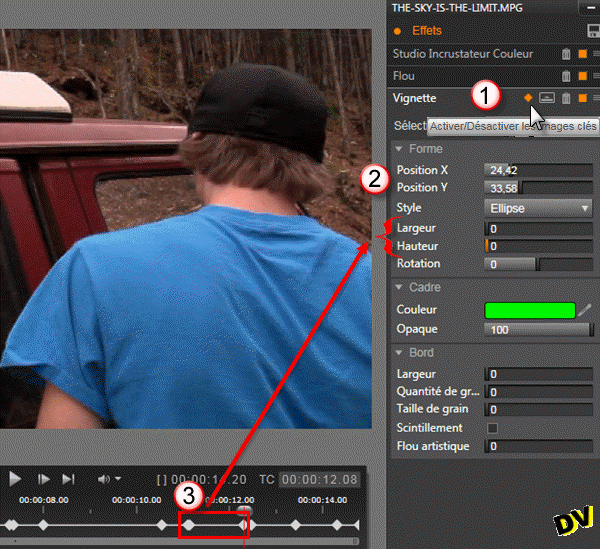 On the video on A/V Track(2), from 1 2D-3D, apply the default HFX Filter effect. Without leaving the Effects Editor, you can select A/V Track(3) in the browser at the bottom and the far left of the window. 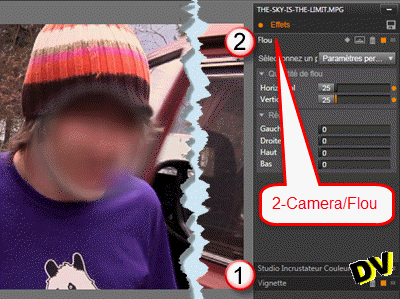 To the video on A/V Track(3), apply a 2-Camera / Blur effect as in step 3 above. The HFX Filter effect is included in the 1- 2D-3D ribbon. 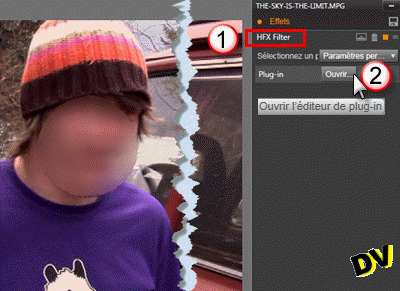 Click the thumbnail of the HFX Filter effect. The HFX Filter effect is applied with the default transition. Blur is already applied to the entire sequence located on A/V Track(3). We'll replace the default transition with the new 403-Spotlight2 transition and in Hollywood FX we will set size and position of the disk, based on the character's movement, using keyframes. More keyframes will mean the spot will more easily follow the face with a smoother movement. Select the HFX Filter effect applied to A/V Track(2). The demo video shows the results of the three methods one after the other. Even after various adjustments, the Quick Pixelator method just wasn't good enough for me. I think the old way works better and is easier to use because the blur disk can be moved and resized with the mouse in Hollywood FX. This is why I do not always prefer modern plugins ..